Issued at 10:47 am Saturday, 6 April 2019. The monsoon trough is currently located just offshore from the northern Arnhem coast, while a ridge of high pressure over Queensland is directing humid easterly winds into the monsoon trough. 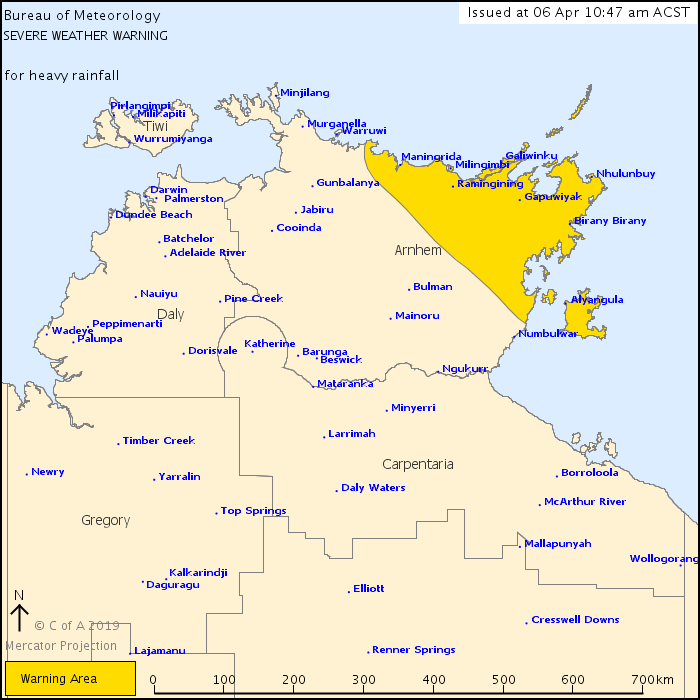 A tropical low is located within the monsoon trough over the northern Gulf of Carpentaria, near 11.6S 138.1E, as of 1000 ACST. This tropical low is expected to move westwards near to the northeastern Arnhem coast today, then continue moving westwards across the northern Arnhem coast during Sunday morning. Current radar and satellite imagery at 1000 ACST shows an area of widespread moderate rain over the northeastern Arnhem District. Heavier isolated showers and thunderstorms are embedded within the rain area. As the low approaches, MODERATE to HEAVY RAIN, which may lead to FLASH FLOODING, is expected for the northeast Arnhem District today, extending further west to the northern Arnhem district tomorrow. 24 hour totals of 60 to 100 mm are expected, with isolated falls of up to 150 mm. Squally showers and thunderstorms are also expected to develop from the east as the low moves closer today. Locations which may be affected include Nhulunbuy, Maningrida, Milingimbi, Alyangula, Galiwinku and Gapuwiyak. Gove airport has received 102.4mm and Groote Eylandt 99.6mm in the 24 hours to 1000 ACST this morning.